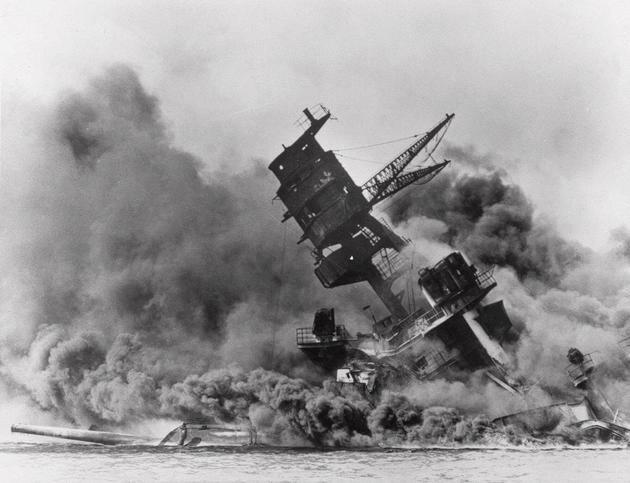 Today marks the 69th anniversary of “a date which will live in infamy” — the devastating Japanese attack on Pearl Harbor that prompted the U.S. entry into World War II. The Navy regrouped, fought back and, four years later, enjoyed the ultimate payback, hosting the formal Japanese surrender ceremony aboard the battleship Missouri. The battleship Arizona belches smoke as it topples over into the sea during a Japanese surprise attack on Pearl Harbor, Hawaii, in a Dec. 7, 1941 file photo. The ship sank with more than 80 percent of its 1,500-man crew, including Rear Adm. Isaac Kidd. The attack left left 2,343 Americans dead and 916 missing. // AP Photo.